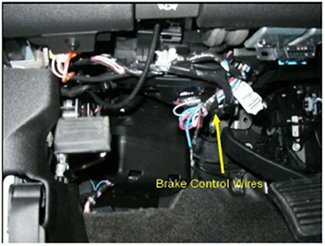 SUBJECT / Summary: Wiring electric brake controls on 2007-2013 GM full size trucks and 2007-present GM SUVs including Cadillac Escalade, Chevy Silverado (new body) Chevy Suburban, Chevy Tahoe, GMC Sierra (new body) and GMC Yukon. PROBLEM: General Motors quit offering the plug in type connectors on these vehicles with a factory tow package. These models have four (possibly five) blunt cut wires under the left side of the instrument panel to the left of the steering column. The wires can be identified by a white label and the color of the wires. The wire colors are (1) Red/Black wire, (1) White wire, (1) Light Blue/White wire and (1) Dark Blue wire and possibly (1) Orange wire. 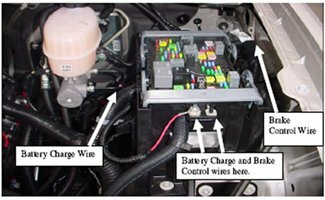 SOLUTION: There are two wires under the hood that have to be connected to make the tow package functional, one is the power wire to the brake control and the other is the battery charge line to the 7 way connector. These wires are both Red/Black with eyelets on them. They are coiled up under the hood and will need to be connected to the under hood fuse box. One of the wires is located between the under hood fuse box and the left (driver) side fender. The other is located under the master cylinder/brake booster assembly. The battery charge wire and the power wire to the brake control have different size eyelets on them and will connect to the threaded studs under the Gray handle at the front of the fuse box. The two studs are also different size. Note: GM does not supply the attaching nut required to secure the wires to the studs. These can be obtained locally. You will need (1) M6 x 1.0 nut and (1) M8 x 1.25 nut. CAUTION: Raising the Gray handle more than 3/8 of an inch to gain access to the studs may result in the fuse box coming disconnected from the electrical connector. If disconnection occurs you may have to consult your local GM dealership for repairs.